There has been a lot of discussion on the larger page size. Some say larger page size blog loads slower than the blog or website that has a small page size. Well today I am going to show you 3 proofs where you can clearly see that page size of a blog still does not affect the loading time or speed of blogger blog or website. In our last post we discussed how you can convert the interview into backlinks and traffic with how to get links from your toughest competitor blog. Now we will discuss how a website or blog page size affect loading time or loading speed of blog or website. I have compared here 6 websites or blog and will show you the screenshot where I figured out that even blog with a larger page size are loading faster than the blogs or website with small page size. Websites With Heavy Images and Without Images. Well in this comparison of 6 websites I have chosen 2 types of category based websites. (1) Websites that are using too many images. (2) Websites with only few images. (3) 3 Most popular websites in the blogger community (you surely know it). (4) 2 Top entertainment Websites from India. You know all technical websites or blogger tutorial very few images and with low KB in size so you may think that their page size is smaller and hence their page loading speed should be higher. And one common opinion about entertainment website is that they use high resolution images and people think that is why their page loading time or speed should be higher. So when we will compare this 2 different type of websites you will know that still larger page size blog does not affect the page loading speed or page loading time of a website or blogger blog. Now check out the screenshot below where I figured out the loading speed and page size of those websites. Now see difference between Problogger and mybloggertricks page size. 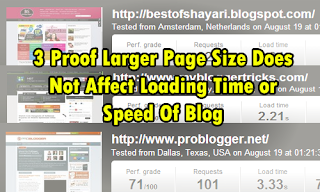 Mybloggertricks has a larger page size but it's loading time is faster than the Problogger. 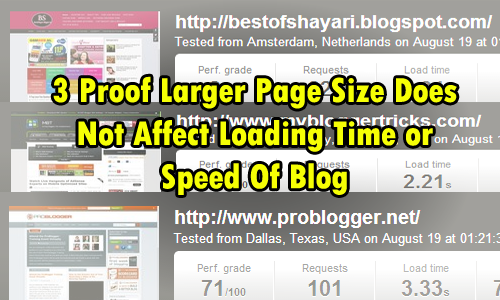 Whereas Problogger has less page size compared to the Mybloggertricks but still the loading time speed is more compared to the mybloggertricks. It is clear from above comparison that even bestofshayari has largest page size of approximate 10 MB but still it is loading faster than the other two websites indiamp3song and basicblogtips. And apart from smaller page size compared to the bestofshayari these two websites or blogs are loading slow compared to the bestofshayari. Number of External CSS sheets. Using Images In CSS Sprites Format . So this is all the extra factors which cause a website or blogger blog to load faster or slower in browsers. I tried to show through a small experiment that only larger page size does not affect loading time or loading speed of website or blog. But it has other many reasons too. And most important is HTTP Requests. Some of the Links That can help you to better optimize pages. So share it if you like and join me on the social bookmarking platform. Where I will share your content too in my circle. Description : 3 Proof where you can see if a blogger blog or website has larger page size even then it does not affect it's loading speed or time.